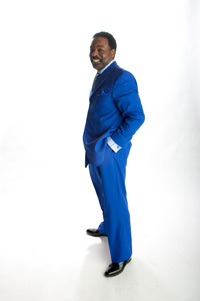 Julius Hopson's smooth style and warm smile makes him an audience favorite whenever he performs. 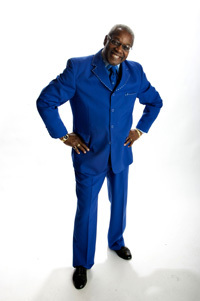 Julius, a.k.a., Jules started singing at age 11 on the street corners of Pittsburgh's Hill District, and at record hops with local legendary disc jockey, Porky Chedwick. After graduating from Westinghouse High School, Jules joined the United States Air Force and served for 5 years. During that time, Jules formed a group called "The Sabers" that went on to win the Air Force worldwide talent show championship. 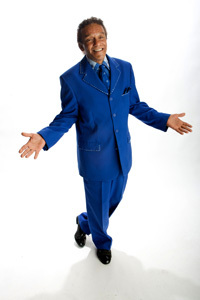 After his discharge from the Air Force, Jules returned to Pittsburgh and became a member and eventually the leader of "The Memories" a Pittsburgh based show and dance band. Jules continued with The Memories for 30 years. The Memories performed with many national groups, such as The Coasters, The Jive Five, The Drifters, Manhattans, O'Jays, Temptations, just to name a few. Jules also spent several years with The Laurels, another popular Pittsburgh vocal group. In 1994, Walt Maddox invited Jules to join The Marcels. He has remained a member of The Marcels since that time and has assumed the role of lead singer. Richard Harris was introduced to music and entertainment at a very young age by his musically inclined parents, Raymond and Edith. His father played several instruments and was known to have instructed the great Stanley Turrentine. Richard grew up in Pittsburgh's Hill District, where he met fellow "Hill" resident and current musical star George Benson. At the age of 12 he and Benson connected and became members of the vocal group, The Altairs. Richard, in collaboration with Benson, recorded Groovy Time in 1957. That same year and the following, The Altairs also recorded demos of Return to Sender and Great Balls of Fire for songwriters, Otis Blackwell and Winfield Scott. These songs went to on to become smash hits for Elvis and Jerry Lee Lewis. In 1961 Harris toured with the "Queen of Blues," Dinah Washington, as a member of the vocal group the Jesters and remained with Washington until her untimely death. He then returned to his hometown, and in 1965 Walt Maddox invited Richard to join The Marcels. Richard not only possesses incredible vocal skills but also dance and choreographic ability, making him a vital asset to the group. He is solely responsible for The Marcels' choreography, and he never fails to bring audiences to their feet when delivering his signature split during the finale of every show. Kenny Mitchell is the newest member of The Marcels, joining the group in March 2011. His warm, distinctive tenor voice is a welcome addition to the group. Kenny is a native of the Northside of Pittsburgh where he currently resides. He graduated from Oliver High School and after graduation served in the Army in Viet Nam. He later attended the University of Hartford, in Hartford Connecticut. From a very young age, Kenny always had a passion for singing and performed with a number of groups, throughout the Pittsburgh area, such as the Jr. Savoys and the Altairs. He left Pittsburgh for a time and resided in California where he continued his singing, joining the group Patience who recorded “This Is All I Can Say” for Columbia records. Upon returning to Pittsburgh Kenny became a member of The Sinceres from 1990 through 1995. He then joined Johnny Angel and The Halos, a popular local oldies group who performed throughout Pittsburgh and surrounding areas. While Kenny’s passion for singing is immense, he is also dedicated to his community and is a Lieutenant with the Pittsburgh Fire Department. Ted "Reno" Smith's enhances The Marcels, as the bass singer with his deep, mellow tone. 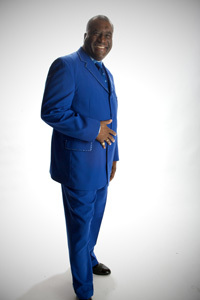 Reno's interest in singing began at the age of 4 where he was introduced to gospel quartets. From that very early age, he was also fascinated by the "Bomp-a-bomp, bomp" of the bass singers of that era. It was a style he longed to imitate. On Saturdays, when his mother had rehearsal with her church choir, Reno was left in the care of his brother. He would take him to the movies and on one occasion, he saw a show that featured The Platters, singing "Smoke gets in your eyes." This also left an impression that would influence his interest in singing. At the age of 8, Reno's friends took him to the local Moose Lodge, where they would pay $.50 per song to any kid that had the nerve to step up to the mic and sing. Reno started with "Short Fat Fannie" and didn't stop singing until the band called for a break. That was his first gig and it netted him a cool $12.00. Once he realized that he could get paid for doing what he loved, he was hooked. Over the years Reno has performed with various acts, including, "Reno and The Gamblers" and "The New Memories". Reno joined The Marcels in 1995 as bass singer and has remained with them since that time. Reno's motto is, "Life is never boring when you're touring!"